Offline files in Windows ? If you’ve ever needed to access important files stored in a shared folder on your network but couldn’t because the network connection was unavailable, then you can understand the need for offline files. Using offline files, you can access files stored in shared network folders even when the network copies are unavailable. You can do this by choosing the network files you want to make available offline, which automatically creates a copy of the network files on your computer. These copies of network files that are stored on your computer are called offline files. Windows will automatically sync your offline files for you and open them whenever the network versions are unavailable. For instructions on how to use offline files, see Working with network files when you are offline. Protect yourself from network outages. When you use offline files, it doesn’t matter if your network goes down or the network folder you are accessing becomes unavailable. If either occurs, Windows will automatically begin accessing the offline copies of files stored on your computer instead of the files on the network folder, and you can continue working without interruption. Work with files while you are away from the network. 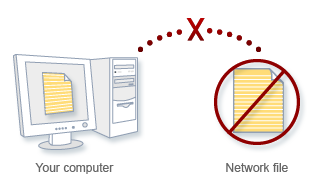 When you disconnect from the network, you normally lose the ability to access any files stored on the network. But with offline files, you can disconnect from the network and still have copies of all the network files you have made available offline. This can be particularly useful if you travel with a mobile PC. Easily sync with network files. Anytime you want to sync with the latest version of files in a network folder, offline files lets you do so with the click of a single button. Boost your efficiency when working over a slow connection. 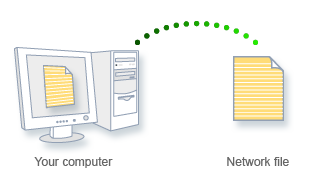 When you are connected to your network with a slow connection, working with files on a shared network folder can be inefficient and slow. Offline files insulates you from this problem by allowing you to easily switch to working with offline copies of your network files at any time. When you select a network file or folder to make available offline, Windows automatically creates a copy of that file or folder on your computer. Anytime you re-connect to that network folder, Windows will sync the files between your computer and the network folder. You can also sync them manually at any time. If you are working offline and make changes to offline files from a network folder,Windows will automatically sync any changes you made to the files the next time you connect to that network folder. If you are working offline while someone else changes files in a shared network folder, Windows will sync those changes with the offline files on your computer the next time you connect to that network folder. If you have also changed the files since you last connected to the network folder, a sync conflict will occur and Windows will ask you which version you want to keep.You can resolve these and other sync conflicts by using Sync Center. For more information, see Resolving sync conflicts: frequently asked questions. If Windows encounters a problem when trying to sync offline files between your computer and a network folder (for example, if the network folder you are trying to sync with is unavailable), a sync error will occur. For more information, seeUnderstanding sync errors and warnings.